Yossi Milo Gallery is pleased to present an exhibition of recent black-and-white photographs by Tenesh Webber. The exhibition opens on Thursday, June 6 and closes on Friday, July 26, with an opening reception for the artist on Thursday, June 6 from 6:00-8:30 pm. Continuing her work in large-scale black-and-white abstract photography, Tenesh Webber's current work is designed to walk the line between abstraction and representation. 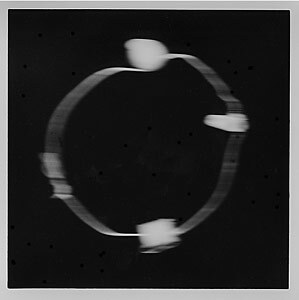 Webber achieves this effect by photographing moving objects—most no larger than the size of her palm—and then layering and arranging negatives to create 40″ × 40″ gelatin silver prints. Each image begins with the creation or alteration of the object to be photographed. Developing ideas from sketches and models, Webber creates the objects from plaster or plastics, or she alters found items to achieve the desired effect (e.g., by drawing or marking on objects to produce blurs on the ultimate print). The artist then photographs the objects in mid-air, using a variety of shutter speeds to achieve different representations of movement. Webber then layers negatives of a single object to create the print. In some prints, for example, the artist has sandwiched a negative of the object in motion with a negative of the object at rest. In other prints, Webber has sliced as many as 15 negatives and then arranged the pieces to form the print. All images in this exhibition are 40″ × 40″ gelatin silver prints. Tenesh Webber's work has been exhibited extensively in the United States and in Europe. The artist studied experimental arts and photography at the Emily Carr College of Art, Vancouver, and at the Ontario College of Art in Toronto, Canada. Tenesh Webber was born in Toronto in 1963, and has lived and worked in New York City since 1983.